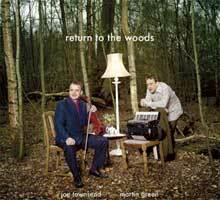 Joe Townsend and Martin Green have recorded an album that walks through the hinterland of jazz, folk, and contemporary music, performed on violin, guitar, accordion, and an array of other instruments such as Mongolian cello, octave violin, musical saw and Fender Rhodes piano. They move from the inspiration of Duke Ellington and Romanian gypsy music, through the minimalism of Adams and Reich and into the darker regions of English folk music. Through imaginative recording techniques such as the placing of tiny microphones inside instruments, playing the accordion through rotating speakers and using vintage keyboards they have produced a unique voice which is constantly changing yet somehow familiar. There's no explaining it; you simply have to listen.